Turmeric, Why All The Fuss? Turmeric is all the rage at the moment, and for good reason. However, there’s more to tumeric than just the friendly yellow powder used in curries, supplements, and tumeric lattes. White Turmeric is often referred to as Zedoaria or Amba Haldi, and is actually the root of the Curcuma zedoaria plant. It is a perennial herb and is member of genus Curcuma and Zingiberaceae family, which includes ginger. The Curcuma zedoaria plant is native to India and Indonesia, but has also been cultivated in Europe and in the US. It was introduced to Europe by Arabs around the sixth century, but its use as a spice in the West today is extremely rare, having been replaced by ginger, which has a more pleasing flavour in cooking. Though white turmeric nowadays is rarely used anymore as a spice and often replaced by ginger, it is still used in Asian cuisine. In Indonesia, white turmeric powder is often added to curry dishes. In Thailand, fresh, sliced white turmeric is used as an ingredient in salads. And in Indian cuisine fresh white turmeric is also used as an ingredient to popular dishes. It has lighter flesh and its flavor is very similar to that of ginger, but with a more bitter aftertaste. Although rarely used in cooking now, it is still possible to partake of this health-giving spice, which is safe for all ages, has no reported side-effects, can be used on a daily basis, and is not known to react with or alter the effects of prescription medicine. 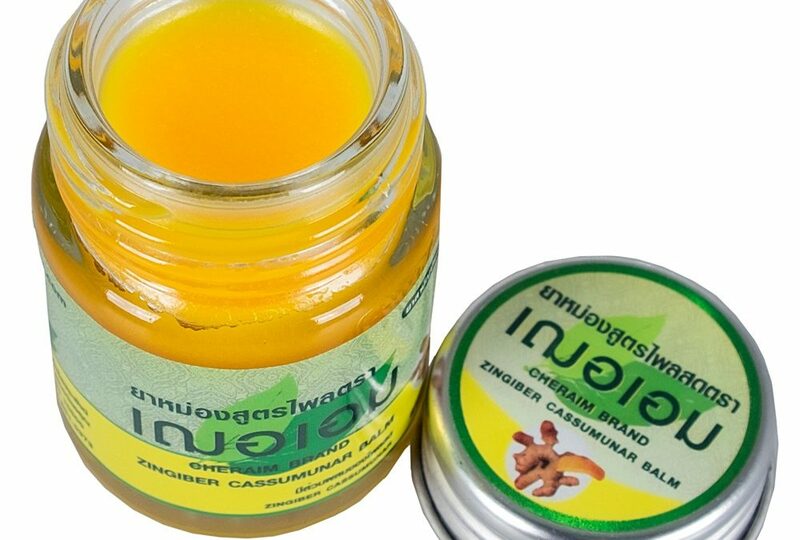 Applying Thai herbal balm from the ancient recipe of Thai traditional well being wisdom can smoothly melt your muscle tension away. Take home a compact bottle as well -no extra time required. Curcuma zedoaria, also known as white turmeric, is typical of the curcuma family in its health giving properties. There are over 100 species in the Curcuma family and one thing that is characteristic of these species is the yellow orange hue. The compounds responsible for this colour are curcuminoids. The three main curcuminoids are: curcumin, bis-demethoxycurcumin and de-methoxycurcumin. Curcuminoids are potent antioxidants. In addition research proves that they also possess anti-inflammatory activity, anti-HIV and anti-cancer activity. What this translates to is a potent and effective method of fighting inflammatory conditions such as rheumatism, tender muscles, and painful swelling. It is also good for healing wounds and skin conditions, and has been known to help with menstrual irregularities and ulcers. As an anti-microbial agent, it inhibits the growth of fungi, bacteria, viruses etc.